As most are aware, I love a good singles club. I sign up for them all the time and I'm reasonably sure I still have a subscription to the Art Of The Underground series that just stopped putting out records for some reason. 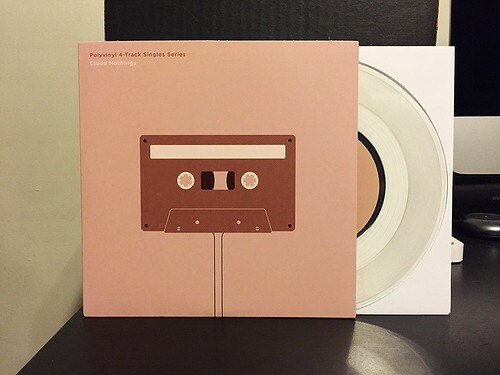 Anyway, Polyvinyl's 4-Track Singles Series isn't one I subscribed to, but it's a pretty neat idea. They have a 4-Track recorder. They then take that same 4-Track recorder and mail it around to a bunch of bands who then record some new songs on it. A neat concept, buy they didn't really sign up enough bands I like to make me want to subscribe. There were two bands that contributed that I did want to track down though, Mikal Cronin and Cloud Nothings. I managed to score the Cloud Nothings 7" for $16. A bit pricey for a 7", but worlds cheaper than subscribing to a series I really had little interest in. The two songs contributed are interesting listens, but cannot hold a candle to the greatness that is their last album. The A-Side "Now I'm Blind" is a loud and explosive song. Cloud Nothings didn't cop out and contribute a few acoustic songs. They went full band and really tested the limits of this little 4-Track. It's blown out, fast and you can barely make out the echoey vocals floating in the background. I would actually be interested in hearing a version of this song that wasn't quite so lo-fi. There's just something about it that I'd like to hear more of. B-side "Living World" isn't really my thing. It's more of a slower, noisy offering. I wouldn't exactly call it a noise collage or anything, but it's certainly not a pop song. It's dark and somewhat meandering. Again, interesting, but not the sort of thing I'm going to be rushing back to the turntable to play again and again. I am glad I was able to get this record without having to commit to eleven other 7"s. As Cloud Nothings' album Here and Nowhere Else is battling for my number one album of the year, I absolutely want to grab everything that they're currently releasing. And as I had mentioned earlier, if anyone has a lead on the Mikal Cronin 7" from this set at a good price, please let me know. Did the Cloud Nothings 7" come with a download card? If so, would you be able to upload the MP3s of the songs?